With the downtown Fort Worth skyline as a backdrop in view and boasting the only waterfront stage in Texas, Panther Island Pavilion on the Trinity River is the perfect place to chill out and listen to live music along the river. 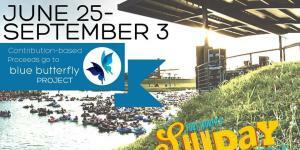 Rockin&apos; the River is just one of many live music events that occur along the Trinity. Whether you want to tube, paddle or kayak (Backwoods Paddlesports offers convenient rentals) or grab a chair and just kick back on the beach, this annual summer concert series held Thursday evenings June - August, offers fun for everyone. Get the most out of your weekend with tubing, music, fun-in-the-sun activities, food and beer at Panther Island Pavilion.